Watching your child grow and change is one of the most amazing privileges of being a parent. It’s at these time when we remember the joy and love that is ‘a family’ and all the other drama melts away. Childhood is also a fantastic time for the body to establish its immune system and emotional readiness for adulthood. Homeopathic remedies through this time are brilliant for strengthening theses immune responses and assisting to help teach the body how to respond fast to ailments, injuries and illness. Let’s face it, toddlers can be challenging and push our buttons, but they are at the beginning of learning many invaluable tools we have as adults, all taken for granted that we already know. In addition to this, their teeth come through, they are yet to master walking or running and their immune system is susceptible to illnesses. As we are all unique, each infant and their susceptibilities are also unique. They are genetic influences and you may notice the similarities swaying from one parent to the next as they grow. We are not able to avoid genes and it is not something to feel guilty about as a parent. You cannot help passing asthma down to your child, but you can help her improve her outcome so that the susceptibility is diminished with their children. I love arming parents with the homeopathic tools to help their little ones at home so that they can choose natural methods of healing that will not be supressing to their constitutions and allow their vitality to become stronger. As you are aware, homeopathics are best prescribes individually, however, there are a few great homeopathics that are known for particular ailments. Arnica – for all bumps and bruises, especially to the head. It is a great idea to have arnica cream and the arnica drops at home to help speed along the recovery and minimise the bruising. Apis – Great for stings and bites, also burns. Starting with theses remedies can help tremendously in your home. Even if it’s just enough to settle the child enough so you can seek medical aid, home remedies are an invaluable addition. More complicated ailments may require further consultation, for instance Chamomilla is a great remedy for teething however, there are a number of other remedies to consider. Rashes, sweat and particular modalities will help distinguish this. Look out, independence starts creeping in and before you know it your little one is bathing themselves, clothing themselves, feeding themselves and making you laugh with their jokes and honesty. Childhood is absolutely magical, a time when the little people of your house teach you how to believe again, dream again, play again! They become more adventurous and aware of things they enjoy. It is important to nurture their development through this time to encourage confidence and health. Arming children with their own kit for sleepovers and camps can be very empowering and reduce homesickness. The growth of a person can reflect many important details about the person. We are influenced both by inherited biological characteristics (nature) and environmental influences (nurture). Developmental psychology explores the physical, behavioural, cognitive and personality changes that occur from birth through childhood and beyond. Through this we understand that there are a few basic emotions that children express from infancy onwards. A child will express their first emotions relative to the needs of their survival or protection. They will then develop these to form emotional states or moods as the child reacts and responds to situations. These states then begin to influence the way in which a child perceives and interacts with the world and their little personalities are formed. Emotional traits are very important in the homeopathic world and are included in the whole picture when prescribing. 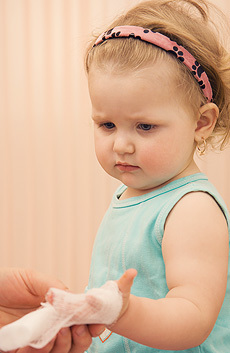 Acute prescribing will take the abnormal emotional traits of a child into account, consulting the parent on what is normal for that child, thus including that in the overall acute illness. Constitutional prescribing will take into account the regular emotional traits to help unravel the child’s chronic illness.